Cardinal Robert Sarah, Prefect of the Congregation for Divine Worship and the Discipline of the Sacraments has again re-iterated past comments, this time in an interview given to a French Magazine, The Christian Family. The translation below is a bit rough and ready but you will catch the general drift. For those of us who went through seminary in the 1980's and who endured all sorts of criticism and disapproval, being side-lined for attempting to do as he suggests, it is amazing that we have now had Popes, Cardinals and bishops endorsing what we were once told was basically an heretical interpretation of the Second Vatican Council. 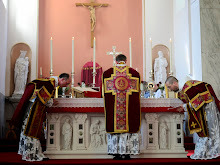 Now more and more diocese are setting up churches for the Traditional Form of the Mass - either under the direction of one of the flourishing Traditional Societies or as diocesan enterprises (to say nothing of the older societies, such as the Oratorians, who now flourish, while other religious who given in to the spirit of the age have no vocations to keep things going) . The latest such enterprise announced just yesterday is to be in Leeds. The new generation of bishops now coming through just don't have the same animus against all things traditional that seemed to be the hallmark of the lentils and sandals generation following the 1960's. They see a wider Church and respond where they see things working and growing. 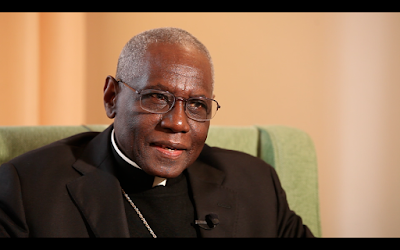 Which is not to say that those of us who are already doing what Cardinal Sarah suggests are now having an easy time of it. In fact, the celebration of the liturgy in the ways he suggests are still pretty rare in most parishes and considered an "oddity". Well, according to the Prefect of the Congregation for Divine Worship, they are an oddity at the heart of the Second Vatican Council's image of the liturgy. Over recent weeks you have expressed the wish to see the Eucharist to be “understood as the central sacrament of sacraments ". Why is that ? I wish we would engage on a greater reflection on this issue, to put the Eucharist at the centre of our lives. I note that many of our liturgies have become entertainment. Often the priest no longer celebrates the love of Christ through his sacrifice, but a meeting between friends, a warm meal, a fraternal moment. In seeking to invent creative and festive liturgies, we run the risk of a too human worship, to match the desires and fashions of the moment. Bit by bit, the faithful are taken far from the gift that gives us Life. For Christians, the Eucharist, it is a matter of life or death! How to put God at the centre? The liturgy is the door of our union with God. If the Eucharistic celebrations themselves are turned into human self celebrations, the danger is immense, for God disappears. We must begin with put God at the centre of the liturgy. If man is the centre, the Church becomes a purely human society, simply an NGO, as the Pope Francis said. If, conversely, God is at the heart of the liturgy, then the Church will regain its vigour and vitality! " In our relationship with the liturgy is the destiny of the faith and of the Church" thus wrote prophetically Cardinal Joseph Ratzinger. The recognition of the liturgy as a work of God opens the way to a true conversion of heart. Vatican II insisted on one major point: in this area, the important thing is not what we do but what God does. No human work can never achieve what is in the heart of the Mass, the sacrifice of the cross. The liturgy allows us to go outside the walls of this world. Finding the sacredness and beauty of the liturgy, therefore, requires a work training for lay people, priests and bishops. It is an inner conversion. To put God at the centre of the liturgy, it is also in discovered in silence— that ability to be quiet to listen to God and his word. I say that we meet God in the silence and deepening his word in the depths of our heart. How do we do that concretely? Convert, to turn to God. I am deeply convinced that our bodies must be involved in this conversion. The best way is certainly to celebrate - priests and faithful - all turned in the same direction: towards the Lord who comes to us. It is not a question, as we sometimes hear, of celebrating with his back to the faithful. The problem is not there. This is turn together towards the apse, symbolizing the East where stands the cross of the risen Lord. By this way of celebrating, we will experience, even in our body, the primacy of God and worship. We understand that the liturgy is our first participation in the perfect sacrifice of the cross. I have personally experienced this; celebrating this way, the congregation with the priest at its head, is drawn to the mystery of the cross at the elevation. But this way is allowed? It is legitimate and complies with the letter and spirit of the Council. As prefect of the Congregation for Divine Worship and the Discipline of the Sacraments, I want to remind that the celebration ad orientem is authorized by the rubrics, which specify the times when the celebrant must turn to the people. There is, therefore, no need for special permission to celebrate turned towards the Lord. Thus, in an article published by L'Osservatore Romano , in June 2015, I proposed that the priests and the faithful look to the East, at least during the rite of penance, during the singing of the Gloria, the Collects and the Eucharistic Prayer. In the minds of many, the altar's orientation change is related to Vatican II. Is it true ? More than fifty years after the close of Vatican II, it is urgent that we read the texts! The Council has never asked to celebrate facing the people! This issue is not even addressed by the constitution Sacrosanctum Concilium ... Moreover, the Council Fathers wished to emphasize the need for all to enter into participation of the mystery celebrated. In the years since Vatican II, the Church has sought ways to implement this intuition. So celebrate facing the people has become a possibility, but not an obligation. The Liturgy of the Word warrants face-to-face reading and listening, dialogue and education between the priest and his people. But as soon as we reach the moment when one turns to God - from the Offertory - it is essential that the priest and faithful look together towards the East. This corresponds exactly to what has wanted the Council Fathers. I think we should return to the texts of the Council. Some adaptations to the local culture have probably not been sufficiently matured. I think of the translation of the Roman Missal. In some countries, important elements have been removed, particularly during the offertory. In French, the translation of the Orate Fratres has been truncated. The priest should say, " Pray brethren, that my sacrifice that is also yours is pleasing to God the Father Almighty. " And the faithful replied, " May the Lord receive from your hands this sacrifice for the praise and glory of his name, for our good and the good of all his holy Church. " In the audience granted to me on Saturday, April 2, the Pope confirmed to me that the new translations of the Roman Missal must respect the Latin text. What are you doing for the participation of the faithful? The participation of the faithful is paramount. It is primarily to be called to follow Christ in the mystery of his death and resurrection. " We do not go to Mass to attend a performance. We go to participate in the mystery of God," recalled Pope Francis recently. The orientation of the assembly to the Lord is a simple and practical way of promoting a real participation of all in the liturgy. The participation of the faithful can not therefore be understood as the need to do "something ". On this point, we have distorted the teaching of the Council. Rather, it is to let Christ take us and associate us with his sacrifice. Only a hardened look in contemplative faith will prevent us from reducing the liturgy to a show where everyone has a role to play. The Eucharist draws us into Jesus' prayer and his sacrifice, because only he can worship in spirit and in truth. What sense does the Church give to this question of direction? First, we are not alone in praying oriented manner. The Jewish Temple and synagogues have always been oriented. By finding this direction we can go back to our origins. I also note that non-Christians, Muslims in particular, are directed to pray in a particular direction. For us, the light is Jesus Christ. The whole Church is facing Christ. Ad Dominum. A Church closed in on itself in a closed circle has lost its reason for being. To be herself, the Church must live before God. Our point of reference is the Lord! We know that He lived with us and He went back to the Father on the Mount of Olives, to the east of Jerusalem. And that He will return in the same way. Stay turned to the Lord, then wait every day. It should not be that God is constantly complaining: " They turn to me their backs instead of turning their face towards me! " ( Jr 2, 27). Full, conscious and actual participation does not mean people clamouring to take part in the performance of the rites, rather, they are fully to participate in the Paschal Mystery they signify. O Beauty so ancient, O Beauty so new.